Hey, Ichiro just went past Barry Bonds on the all-time hit list! If you try to explain baseball to a person who hasn't grown up with it, you'll be in for puzzled looks, and lack of understanding why they have to sit in a stadium for hours on end without seemingly that much going on. Hey, a soccer match is done and dusted in less than two hours, after all, or about the time it takes you to gulp a few watery, overpriced beers and eat a hotdog. Baseball, however, is America's favorite pastime, and who doesn't remember fondly their dad playing catch with them as kids in the driveway, or visit a shrink as an adult because he never did? With the power of today's phones, however, you can relive those fond childhood memories on the go, as there is a variety of apps that get you in the game, and never let you go. From local team apps, through the official Major League one, to fantasy baseball runs, those Android and iOS apps have it all, so check out some of the best pieces of software for the baseball fan in you. Not for nothing, but if you expected something in this list to beat the official MLB app, you will be in for a disappointment. It's all here - teams, schedules, scores and players, breaking news and star interviews, with as much stats as can fit in the Library of Congress. TheScore is perhaps the most renowned third-party sports app, and for a good reason. A smorgasbord of team and player stats, game recaps, live breaking news and commentary - it's all here, and with a nice and easy interface to boot. Another great official baseball apps, MLB at the Ballpark is for those who actually go to the games - it gives you the schedules, tickets, and even parking spaces allocated for the fans, plus you can order that proverbial watery beer and hotdog straight from the app, pretty cool. Missed the game? No worries, Watch ESPN will get you replays and highlights on the go, plus you can stream your favorite baseball shows like the Tonight one to catch up on the witty phrases. GameChanger is for the more proactive baseball fans, who aren't just changing the beer-sipping venues from the couch to the stadiumbut are actually taking part in live games, and would like to keep the local league's score in an easy way. Well, keeping tabs on the local teams is just one aspect of GameChanger, as it allows you to also stream your games, recap them, preview stats and share everything with your teammates, friends and family. 9 Innings needs no intro, as it is one of the most comprehensive ball simulators out there, with stats and "biorhythms" of 1,400 players in 30 teams, and the roster is updated constantly. Not too keen on reality? 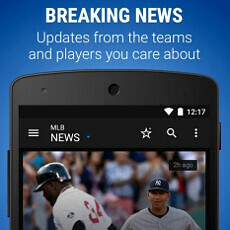 Well, fantasy baseball is for you then, and the CBS app is one of the most comprehensive app offerings out there that lets you create your own made-up baseball league, and march towards the top of the charts with the full game-on experience, just concocted out of thin air.